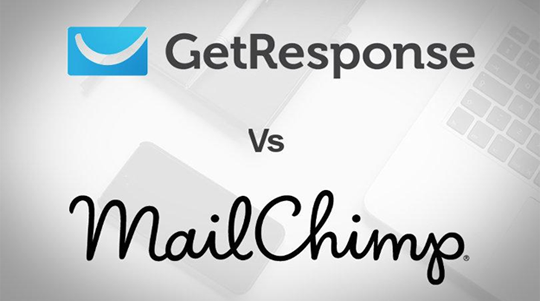 GetResponse Vs MailChimp - Who Offers Best Marketing Automation? If you have tried email marketing, you must know the importance of marketing automation and email marketing tools. I am right on the point that there are variety of email marketing tools available in the market with numerous numbers of features, branding and pricing details. The competition is very tough, no doubt. We have some good names like GetResponse, MailChimp and more. And in this post, we are going to compare the features of GetResponse and MailChimp so that you can decide which one is best suitable for your needs. GetResponse and MailChimp are two most popular and known email marketing tools with hundreds of best and unique features. Of course both of them keep on introducing some new features and updates so that they can attract more and more customers. Nowadays a very new feature “Marketing automation” is talk of the town. Almost everyone owning any online business is talking about email marketing tools with market automation feature. Let’s have detail look on what is marketing automation. And which email market tool is best when it comes to marketing automation. You must have heard the term “Autoresponder”, If not then let me tell you that the idea of autoresponder is to send automated emails to your subscribers after specific interval of time. These emails are automatic and will be sent to all your subscribers and you don’t need to put a proper check and balance on it. Almost every email market tool now has this feature. So it’s good but kind of old feature now. So people are more attracted towards marketing automation these days. Which is the same but little more advance than autoresponders. Marketing automation allows you to send an onboarding series to introduce your business to every new customer. It will follow up your customer automatically and will be suggesting new products to them. It can surprise your subscribers on special occasions like Christmas with special discounts and coupons. Send reminders to customers if they have left something in their cart. And keep motivating them to try new products from your online store. So that’s an amazing feature offered by both GetResponse And MailChimp. Let’s see how it works with both the tools. You can set up new campaigns no matter how difficult are they with their easy drag and drop tool. 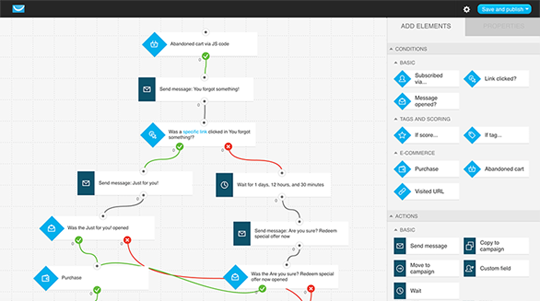 The entire user experience can be drawn by simple using powerful workflows. E commerce abilities to track and address the visitors and successful buyers. You can build intuitive workflows by simply arranging ready to use blocks. Conditions: create automation events depending on the user behavior. Filters: Apply filters just in case you need to increase the impact. GetResponse marketing automations helps you to increase conversions. Marketing automation helps you to react to the subscriber's actions in a way you want. Its scoring and tagging feature lets you create more precise segments. So you don’t need to worry about your low conversion rate because Getresponse marketing automation is there to cure your problem. Isn’t it so simple and easy? So don’t waste your time and start with GetResponse 14 days free trial now to enjoy its simple yet most outstanding market automation feature. 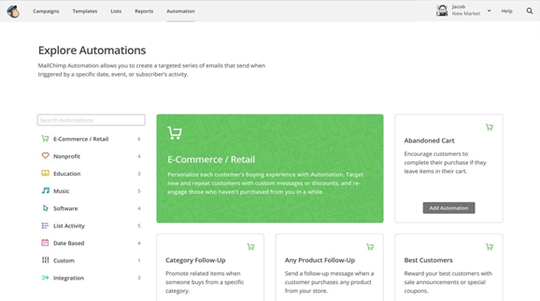 MailChimp Offers a huge collection of “present automation of Workflows” that will make it quite easy for you to find the right flow just in few clicks. Once you are done with selecting your favorite workflow you can adjust or edit and simple drag and drop option. So go and design more relevant and beautiful emails for your subscribers to catch their attention at once. MailChimp integrates with your favorite apps and other web services that you use on daily basis like WooCommerce, Ebay, Bigcommerce, Shopify and etc. You can connect your store to track more visitors to your websites. Once the visitor will visit your website, grab the information regarding him/her to send him workflows based on purchase history and purchasing behavior. Isn’t that’s simple and easy? Yes all thanks to market automation tool for reducing our efforts and saving our time. Now you can do all this hectic work just in few clicks. Your first impression should be very powerful. So create a very powerful first impression by either sending them warm welcome like welcome email or on boarding series with all the details of what you are offering to them. Sent automatic reminders to your customers in case they have forgotten something in their cart. Or keep them motivating to buy new products as well by sending them discount offers or coupons. Greet them on their special occasions also with highlighting some products or services they are missing. Yes you can now do this all with the best market automation feature of MailChimp. Well after reading the above details you can decide it yourself that which email marketer can provide best market automation. In my point of view both GetResponse and MailChimp are outstanding when it comes to market automation but in the end you have to select one. So my vote is for GetResponse. As GetResponse have more things right about it, Its modern email interface, email marketing and market automation features are the reason why I will prefer GetResponse over MailChimp. You can go and get a free trial of GetResponse now and start benefiting your online business now with its outstanding yet simple and easy market automation features. I hope this article would be helpful for you.